This page covers inspection of material, sample preparation and storage and was edited by Jane Royer, Mark Blacket, Matt Krosch and Karen Armstrong. Fruit should be inspected for puncture marks and associated necrosis. Suspect fruit should be cut open and checked for larvae, although small larvae cannot always be detected. If immature stages are being reared to adults infested fruit should be held in a container which has a gauze cover to allow aeration. See Rearing fruit fly larvae to adults for the purpose of identification. Fruit fly adults, larvae and eggs should not be transported if they are suspected of being exotic. Adults, larvae or eggs should be placed in a sealed vial or container and be suitably preserved (see Preservation techniques for morphological identification). The vial should have a label stating the collection details including: the collection location, collection date, host and collector. Adults can be killed by freezing for an hour and stored dry in a vial with tissue to protect the specimen. Infested fruit can be reared in situ if not suspected of being exotic, or if the laboratory is an appropriately accredited quarantine facility. Fruit flies for molecular analysis should either be stored in ethanol as close to 100% as possible, or preserved dry (moisture causes DNA degradation). Samples with ethanol should comply with Australia Post requirements. Appropriately packed volumes of ethanol less than 30 ml are permitted to be posted within Australia under Special Provision A180. Dry unpinned specimens should be stored in a vial lightly packed with tissue to avoid specimen damage in transit. Samples should be registered when they arrive in the laboratory, stored securely so they are not lost, and data recorded appropriately to ensure ‘chain of custody’ of samples. Trapped adult specimens may be preserved by freezing prior to identification to prevent deterioration. Reared adult specimens can be preserved as dried pinned specimens. 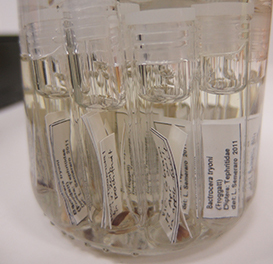 Avoid storing specimens for morphological identification in ethanol/alcohol/propylene glycol. They leach diagnostic colours and patterns necessary for identification. Morphological identification should be conducted using tools elsewhere on the Fruit Fly Identification Australia website or keys such as Drew 1989 or Drew and Romig 2016. Adult flies are generally always needed to make an accurate species identification; however under some circumstances larvae will need to be preserved for morphological examination to at least identify them to family or genus level. Under these circumstances, larvae are preserved by first placing them in hot (approximately 65°C) water for 2-4 minutes, after which they are removed and allowed to cool to room temperature. Once at room temperature, immerse larvae in 50% ethanol for 15-30 minutes then transfer to 70% ethanol for storage ensuring all relevant collection information is included with the sample. Further details on subsequent procedures for slide mounting is provided in ISPM-27 DP9 (Diagnostic protocols for regulated pests: Genus Anastrepha Schiner). If a sample is being preserved for molecular identification it is important that suitable preservation methods are applied as soon as possible (see table below). Moisture damages DNA: a high concentration of alcohol, propylene glycol or freezing are suitable ways of preventing DNA degradation. Generally DNA yields are reduced as specimens age (e.g. Dean and Ballard 2001). However, all of the preservatives outlined below appear more effective when combined with low temperature (i.e. refrigeration or freezing), increasing the preservative effect (e.g. Moreau et al. 2013). Cross-contamination could be a potential issue when storing multiple species specimens in bulk, care must be taken with some types of samples (e.g. dry-frozen adult flies) that the sample used for molecular testing (e.g. leg) is from that actual specimen. Adult specimens are commonly frozen (-20°C or -80°C) to preserve them. This is a good way to maintain DNA quality and retain a useful morphological specimen (see alcohol note below). Freezing however can be of limited use when collecting in the field. Highly concentrated ethanol (95-100%) is commonly employed to preserve specimens for molecular testing (all lifestages). However, please note that adult flies preserved in ethanol lose their colours over time (i.e. losing morphologically diagnostic information). Isopropanol is also sometimes employed as a preservative (e.g. for midges); while other forms of alcohol, such as methylated spirits are not suitable for DNA preservation. Larval specimens are commonly blanched in hot water prior to preservation (to aid morphological identification), this practice does not seem to adversely affect DNA quality. DNA appears to degrade over time when specimens are stored in a lower concentration of ethanol (<80%), commonly employed for morphological preservation. Adult material collected from traps is commonly collected into propylene glycol (e.g. Vink et al. 2005, Moreau et al. 2013), especially in the tropics. Propylene glycol does not evaporate (unlike ethanol) and can thus be used both for wet trapping and for subsequent preservation of specimens (e.g. Moreau et al. 2013). Propylene glycol at concentrations of 40-100% has been shown to be effective at preserving insect DNA (Ferro & Park 2013). An additional advantage of propylene glycol is that it is non-flammable making transportation of samples easier (e.g. Moreau et al. 2013). This solution can be used to preserve not only the DNA but also the RNA (e.g. Vink et al. 2005). Overall, it appears that DNA yield might be reduced in RNAlater preserved material compared with ethanol or propylene glycol preservation (Moreau et al. 2013), although for some specimens RNAlater appears equally effective (e.g. Vink et al. 2005). Preservation of RNA is critical for transcriptome-based applications such as differential expression analysis and candidate gene discovery. RNAlater is not an economical option for large bulk samples and is best used to store small numbers of conspecific specimens. Critically, RNA degrades much more rapidly than DNA, thus any trapping design intended to capture RNA profiles from specimens needs to minimise the time between a specimen entering a trap and preservation. These can be used for preserving DNA from larval samples, and these have been shown to be suitable for use under tropical conditions (e.g. Blacket et al. 2015a). Please note that material preserved this way does not retain any morphological characters. Commonly employed sample preservation techniques for molecular identification. Methods that are suitable for a particular life stage are indicated by '+', those that are less suitable are indicated by a '–'. * Storage of dry adults (e.g. trap samples) short-term at ambient temperatures is often employed until one of the more effective preservation methods is used; wet adults stored at ambient temperature rapidly degrade (both morphologically and molecularly).